In episode two of the Marketing on Tap podcast, we take a look at how backlashes can start quickly when brands looking to be socially responsible get it wrong. Elon Musk, and his attempts to help – some would say hinder – the rescue efforts to free the kids trapped in a cave in Thailand, is a perfect example of a “good deed” gone wrong. Can brands ever be truly good with their intentions, or does it simply come across as a poorly-executed PR stunt? Sam Fiorella: Welcome everybody, we are back, much to maybe the chagrin of some of you. We are back with our second episode of Marketing on Tap. This is my mate Danny Brown, Sam Fiorella here at Sensei Marketing. Sam Fiorella: Today, we are talking about, I guess a timely issue, a timely topic. Something that really struck me in the news lately. Some great, great news, I guess maybe is the way to put it. It’s great news. You’ve all been following the story, I’m sure, of the Thai soccer players, those students, the teens that got stuck in that cave for I forget how many days they were stuck in there. Sam Fiorella: 13, 14 days. The whole world was just riveted to this. There was obviously a lot of concern, and just today, they announced that they were saved. Fantastic. Unfortunately for us, what caught our attention is some of the negative publicity and how Elon Musk’s name got thrown into that. That’s what we want to talk about today, and explore the idea of is corporate social responsibility or just being cognizant of what’s going on in the world and as a corporation, trying to help out, is it worth it anymore or is the negativity just too much, that’s being developed on social media? That’s all we want to focus on today. Sam Fiorella: First, this is Marketing on Tap, and you guys already know that Danny and I love our craft beer. Today, we are actually having one of our favorites. Danny Brown: Great Lakes Brewery, not to be mistaken with the American one. Sam Fiorella: Right, which I think is in Cincinnati, right? Danny Brown: I think so, yeah. It’s the same age, 30 years old. Sam Fiorella: 30 years old, yeah. No offense to them, but they’re in the United States. I’ve never tried their beer, but this is Great Lakes Brewery here in, actually they’re local to us, they’re in Toronto. We’ve been down there a couple times. A couple times. Sam Fiorella: We can actually almost walk there. Anyway, today, again, because it’s summer, I don’t normally like to drink lighter pale ales or IPAs personally, but this one here is just so fantastic. It’s called Canuck Pale Ale. How perfect is that? I love the marketing of these guys. Sam Fiorella: This one here, I always like to read the back of these cans, because the marketing that some of these craft breweries put out I think is really clever. These guys in particular, one of my favorites from them is the Harry Porter. Obviously it’s got like a wizard on the front, is one of their characters. It’s one of their better beers, or Over My Dad Bod. Danny Brown: Over My Dad Body Pilsner. Danny Brown: Yeah, a subject of how does Canada market itself. Sam Fiorella: What is this … Does it even have anything to market to? What, are we just saying sorry? Sorry. Sam Fiorella: Sorry, I digressed, I’m sorry, eh. It says, “This beer doesn’t help much with that.” All right, I guess being honest is a good marketing tool. “From the fiercely irresponsible and stereotypical image of the front of this can, to the distinctly American style beer inside of it, we’ve really made a mess of things. What have we done? Sorry.” That’s what it says there. There you go, sorry, so maybe that is about as Canadian as it gets. Sam Fiorella: Anyway, cheers mate. Sam Fiorella: Looking forward to this conversation. This one is distinctly more hoppy. Danny Brown: It’s a pale ale, it’s not an India Pale Ale, but it’s still a pale ale. Sam Fiorella: This one I’m okay. You know that I’m not a fan of the hoppiness, but this, unlike the India Pale Ale, doesn’t have the bitterness that I typically find with an India Pale Ale. Sam Fiorella: Anyway, that’s not what we’re here to talk about, but we do love this beer. Let’s get into the topic. Danny Brown: Yeah, shoot. Like you said, Elon Musk, he offered one of the submarines that his team’s built, like one of the rocket powered submarines, to go under the cave and bring the kids out. It was designed to be submersible, get so many kids on it, and bring it through the tunnels. Unfortunately, he turned up at the rescue site with the sub. Unfortunately, it wasn’t compatible for this particular mission. One of the rescue chiefs loved the idea of help, but it wasn’t really good for this particular mission. Danny Brown: A bunch of people obviously saw this on Twitter, Facebook, etc. Then the negativity started coming out, “It’s just a big PR stunt. Why is Elon Musk even there? He must have known it wouldn’t be ready for this mission.” Etc., etc. You did have some people supporting him, saying, “The guy’s doing something. What are you doing?” It’s very back and forth. Danny Brown: I guess the topic is was it perceived as a good deed, pure and simple, because it’s Elon Musk? Was it because it’s Elon Musk, he’s thinking a way to brand Tesla and his company products. Sam Fiorella: It’s a real shame. The cynicism, and mind you in my old age I’m becoming pretty cynical myself, so I guess I really shouldn’t be calling anybody out. It is a shame, just the amount of cynicism that we have fostered as a community. I don’t know if that’s because of social media, social media just highlighted what was already there, I don’t know. It really is a shame, because this is something he did. Sam Fiorella: There are so many companies that have done this sort of thing, and it’s worked for them. Why is it that this one didn’t work? Is there a trust factor there? Is it just because we’re cynical and no matter what anybody does, that’s going to be the way it is? Danny Brown: I think it’s both. I think with this one, Elon Musk has had a bit of a hard time in the last six to twelve months I guess. It doesn’t look good on the Tesla model, for example, you have failing there. Telling investors they didn’t know what they were talking about, that kind of stuff. He’s had a bit of negative publicity himself. I think the fact that he turned up at the site, it’s an ongoing rescue mission, he’s maybe not qualified to obviously be part of a rescue mission. Maybe it’s the fact it was so personal, perceived as in your face, that those are the kind of character that Elon Musk is. He can be a bit of a divisive character. Danny Brown: Oh right, yeah, yeah. Sam Fiorella: Do people trust corporate social responsibility? One of the interesting things that I saw in that is that one-third of the people that were surveyed said that national businesses will not ever be part of the community. They’re never going to be accepted because there’s this trust and you’re a big business. Yet, 45% of those same people surveyed said we need corporate dollars to sustain these local efforts. Sam Fiorella: What I got from reading that study is that there’s a trust issue. My question to you, I think what I’d like to be able to sort of do with these conversations is can we find, which is what we always do, if we were going to do this campaign, how would we have done it differently? 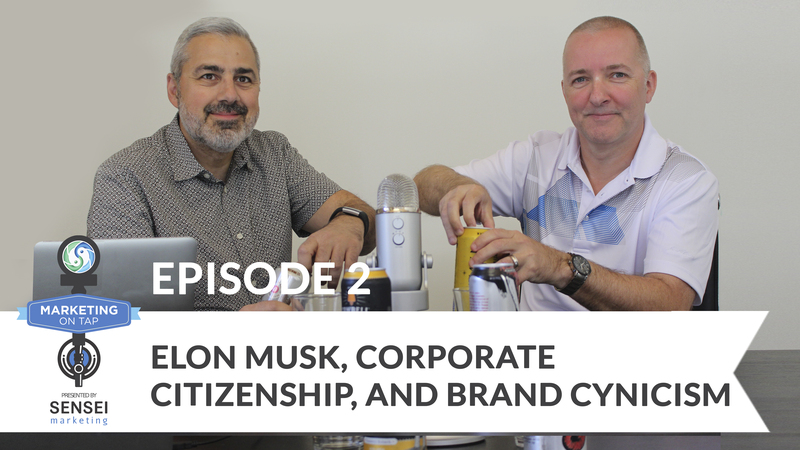 If we were Elon Musk and we were their marketing company, what would we have done differently? That’s usually what we do with a little bit more curse words in there. I don’t know that we want to go down that path. Although, maybe another couple of beers, we’ll see how that goes. Sam Fiorella: Maybe what I would have done differently is not had Elon Musk himself present it. In my mind, if the corporate social responsibility is a byproduct of the staff getting together and doing something, I think it would come across a lot more authentically than let’s say the brand itself. Saying, “We are going to do a corporate social responsibility, save the lakes, save the forest type of campaign.” I think just the fact that people are so cynical today, I find this really hard for anybody to ever overcome that. It’s just fraught with risk. That would most likely be my recommendation. Sam Fiorella: For those of you that don’t know, the charity that we run, the Friendship Bench, DIG, Distinct Infrastructure Group, they do their annual ride for mental health awareness. That’s something they’re doing next week, actually. They’re going to be doing their third motorcycle ride. That’s an initiative started by one of the employees, a VP of Sales. He’s a big rider, and him and his friends get together ever summer, they do some type of tour someplace. He said, “Let’s raise some money while we’re doing it.” I think that’s coming across really, really well, because it isn’t the company that’s doing it, it’s the staff that got together and did it. Sam Fiorella: I don’t know, what do you think? Is that a better way to do it, to overcome the cynicism? Danny Brown: It’s definitely a better way. It comes back to, again, if you go with influence marketing, it goes back to relevance to your campaign. If you class the good deed as a campaign, the relevance comes in. You wouldn’t want, for example, Joe Butchers to be sponsoring a local park for vegans, or where vegans go to relax. It just wouldn’t make sense. Danny Brown: One of the companies I used to work for was an agency of the Ontario government, OG. The good work that they did was all staff driven. The executives would open up the program ideas. The staff would come back with ideas relevant to their communities. Then that built the trust up for that. The trust has to be there. It has to make sense, that it’s not seen as a corporate tax write-off and this is why we’re doing it. I think if you have a connection to the community or a connection to the cause, much like DIG has with the Friendship Bench, that makes a huge difference. People see it’s being done for the right reason, as opposed to trying to get DIG new customers, for example, or anything like that. Sam Fiorella: I think that’s a really good thing. Certainly, DIG does put their logo on it, but I haven’t seen any negative backlash for that. Again, because it was the guys writing it, it is in their corporate mission. I don’t know if that’s it. Danny Brown: I think the main thing, one of the things, it’s not even from a marketing point of view, but from a CSR point of view, is reaching out through the back channels and organizing. I’m sure Elon Musk went through the back channels and spoke to the, I’m going to assume he spoke to the rescuers, as opposed to just turning up with his rocket ship. Sam Fiorella: If he did, would he have showed up with his little rocket powered submarine? I don’t know. Yeah, that’s a good … Going back to influence marketing, what I would say is don’t promote it yourself, allow somebody else to promote it. Do it, do it quietly, and if it works, then the media will pick it up and will give you all kudos. I think that’s one way to cut through the cynicism, because you yourself are not showing up there with fanfare and spotlights, fashion lights on you, and a bunch of cheerleaders behind you with pom-poms and stuff like that. That’s another great idea, just do it quietly and if it works, the media will sort of take care of the PR that you might have wanted anyway out of it. Sam Fiorella: That makes sense. Danny Brown: Especially when you have a certain brand and a level like that. Sam Fiorella: The other thing is I think one of the challenges right now is that there’s a discrepancy just in some of the news that I’ve been reading with CSR campaigns that have failed. CSR being corporate social responsibility. There’s a disconnect between the brand or the reputation of the brand and what they’re trying to do. Danny Brown: The cause, yeah, exactly. Sam Fiorella: You know what I mean? You’re trying to save the forest, yet you’re a polluter of the forest. You don’t have any conservation campaigns running inside your own corporate offices to save paper, yet you’re publicly trying to save a forest. I’m just making that up as an example, just to show that I’ve seen so many of these types of cases. I think again, it goes into trust. Do you really need to be a social business? I think that’s what it comes down to, right? Danny Brown: Yeah, you have to. It comes down to your makeup as a business. Your culture has to be from the ground up, since you started, “This is what we stand for.” Obviously, you can change your mind a little bit down the road, and take on causes that mean something to you because of something that happened in your life or something. It has to be inherently part of your company culture, that you stand for this or you support this, to actually put it out there and show you are a company, a good corporate company. Sam Fiorella: The Elon Musk case, is that an example of reverse selectivism? Danny Brown: Yeah. I think that’s what annoyed me the most. [inaudible 00:14:49] like a 12K charity, back in 2009 or whatever. We got accused of selectivism, because we were asking, “Donate what you can. If you can’t donate, share our message.” We had so-called charity consultants tell us off because we weren’t asking for the big bucks or we were doing the whole shares and stuff, but it worked. We got great awareness, we got great funds for the charities we were doing. I think it’s an insult to anybody that’s trying to do something, to call them selectivists, because what are you doing? You’re sitting there complaining about someone, what are you actually doing to the program? Danny Brown: This is like reverse selectivism, where if you keep complaining about people doing good things, whether it’s to raise their profile, they’re doing something. They’re trying to help. Then you stop helping, and then where are we? Sam Fiorella: I’m getting the bell here for last call on this topic. Your final thought on this? What takeaway do we have from this example? Danny Brown: I’m assuming, if you’re going to do something like this, make sure that it’s wanted and welcomed by the people you’re trying to help. Danny Brown: Exactly, first. Do it through the back channels, like we mentioned, and try to get a feel for what’s going to happen. Then celebrate the win after you have the win of rescuing the kids or whatever the deed is for that particular opportunity. Sam Fiorella: Right. I think, for me, the takeaway would then again be, don’t do it yourself. I just want to reiterate, I think a point that came up in our conversation earlier, which was let’s encourage your staff to come up with something, but allow them to actually organize it, run it, and then promote it. As opposed to it becoming an actual part of your campaign. You can hire a company to help the staff do that, if they don’t have the organizational skills to do it or the resources to do it, but let it be something that is generated by them, run by them, and I think it’ll go a lot further. Sam Fiorella: Anyway, that’s I think our time for today. For those of you watching on video, thank you. For those of you listening wherever you’re listening, join us again next week for another 15 minute conversation with a couple of craft brews. Always important. Cheers everyone.